Consistent quality, accuracy, and performance are the hallmarks of Hornady ammunition. 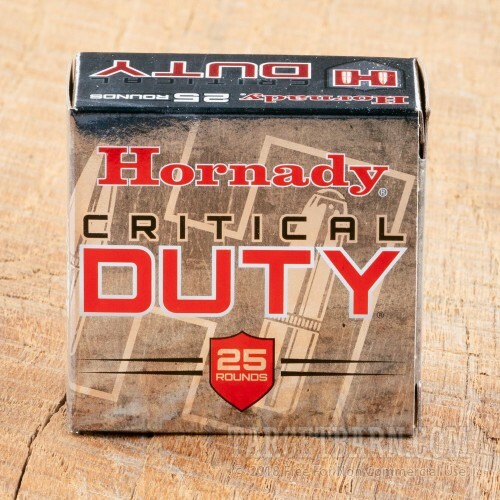 A great option for law enforcement, tactical professionals, and personal defense, Hornady Critical Duty ammunition combines two revolutionary features to deliver superior performance and increased barrier penetration. 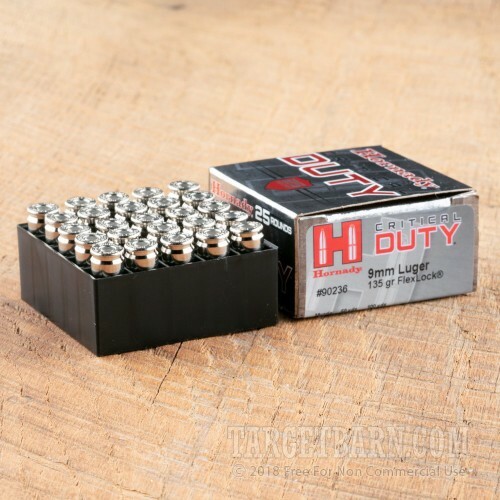 Each of these 25 rounds of Hornady Critical Duty 9mm luger (also referred to as 9x19mm parabellum) features a 135 grain jacketed hollow point (JHP) projectile made with a high-antimony lead core. 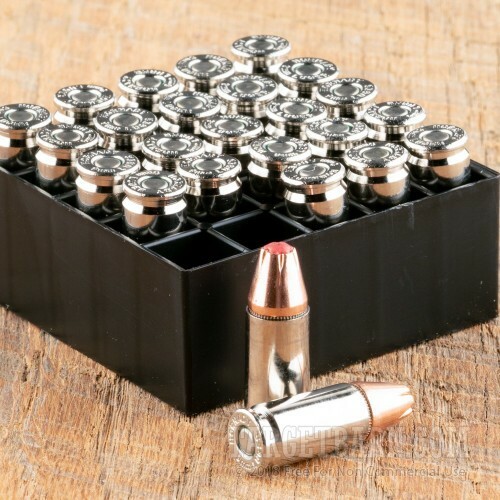 Featuring a patented Flex Tip design to eliminate clogging and enhance bullet expansion, as well as an Interlock band to prevent jacket-core separation, these rounds deliver proven terminal performance through all FBI test barriers every single time. This new production ammunition is boxer primed and delivers a consistent muzzle velocity of 1010 feet per second and 303 foot pounds of muzzle energy. Loaded in bright, reloadable nickel-plated brass casings, these cartridges make loading and chamber checks in low-light conditions simple and easy. Also, loaded with low-flash propellants to preserve night vision, Hornady Critical Duty rounds are perfect for all conceal carry and law enforcement applications. Need a bulk pack for marathon training or long-term storage? 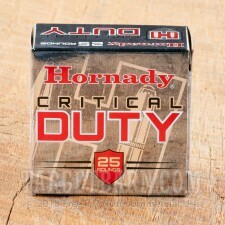 Get the full 250 round case of this Hornady Critical Duty 9mm ammo here.